I grabbed the dustbuster as I walked out to the garden this morning, hoping to inaugurate a new era in Japanese beetle control, who began their summer feeding early this month. The dustbuster was ineffective, the beetles passively dropping from any leaf as soon as the nozzle came within a few inches. Even beetles caught in flagrante delicto decoupled and dropped. This year’s approach to Japanese beetle control will be laissez-faire. Spraying a chemical insecticide like Sevin is too disruptive to the ecosystem. Most organic insecticides, such as neem oil and pyrethrum, are either of limited effectiveness or require too frequent reapplication. And anyway, the beetles attack too many different kinds of plants to make spraying feasible; I’ve got over a dozen varieties of grapes, a half dozen varieties of roses, many varieties of filberts, and a dozen hardy kiwi vines scattered all over the place, and these are just a few of the beetles’ favorites in my garden. In past years, I’ve put traps a couple of hundred feet apart at either end of the property. Each morning, the catch bags were stuffed full of beetles. But many of those trapped beetles would not have been on-site were it not for the allure (from sexual and feeding attractants) of the traps. The traps seem to work best when only a few Japanese beetles are in the area. 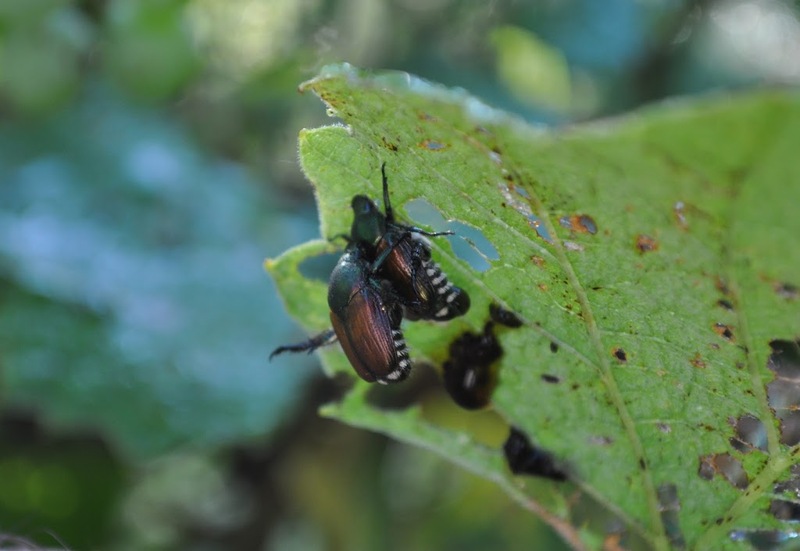 Japanese beetles can get sick from a fungus that attacks them while they spend late summer to late spring in the soil as white, C-shaped grubs. You can purchase the disease, milky spore disease, with which to infect them. Problem is that the disease is of limited effectiveness: Not enough grubs sicken and die and, even if effective, beetles emerging in summer can fly over from neighbors’ untreated yards. I’ll probably do a little handpicking, knocking or dropping beetles in early morning, while they are still drowsy, into soapy water, from which an escape is too slippery. Hand to hand combat is satisfying and surely effective (for the ones killed, at least). Japanese beetles emit an aroma that attracts more beetles, so hand to hand combat is also intellectually satisfying in the knowledge that each beetle killed means fewer new ones attracted. The laissez-faire approach has its merits. Plants tolerate a certain amount of defoliation, the remaining greenery ratcheting up photosynthesis to make up for leaf loss. And if the plants can just hang on for a few weeks, the beetles then begin their exit anyway, their attention turning to laying of eggs in the ground to hatch into grubs for next year’s beetles. Well watered, lush lawns provide ideal conditions for egg laying and grub development; ‘nuff said. Flea beetles, which have peppered the eggplants’ leaves full of holes, will not be emulating Japanese beetles and exiting stage left anytime soon. 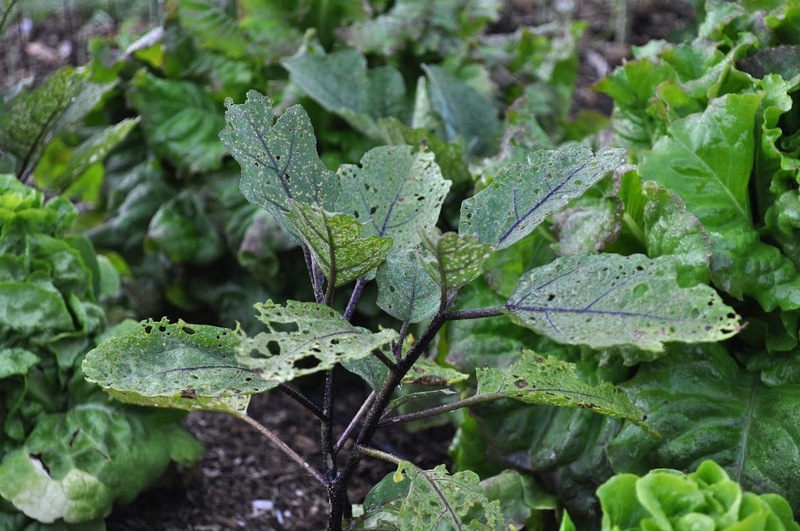 If you grow eggplants, you have flea beetles, except for perhaps the first year or two in a new garden, before the pests have found your site. Other favorites on flea beetles’ menu are radishes, arugula, and turnips. Flea beetles, in contrast to Japanese beetles, can be feasibly thwarted. A dustbuster, in this case, can be effective if used frequently enough. A thick mulch might interfere with their emergence from the soil. Fine mesh fabrics, — “floating row covers” — act as barriers although I like to be able to see my plants and the cover has to be removed during bloom to allow for pollination of eggplants. Mostly, flea beetles are a concern with young seedlings, which can be killed, and for commercial growers, because customers don’t like to buy hole-y vegetables. 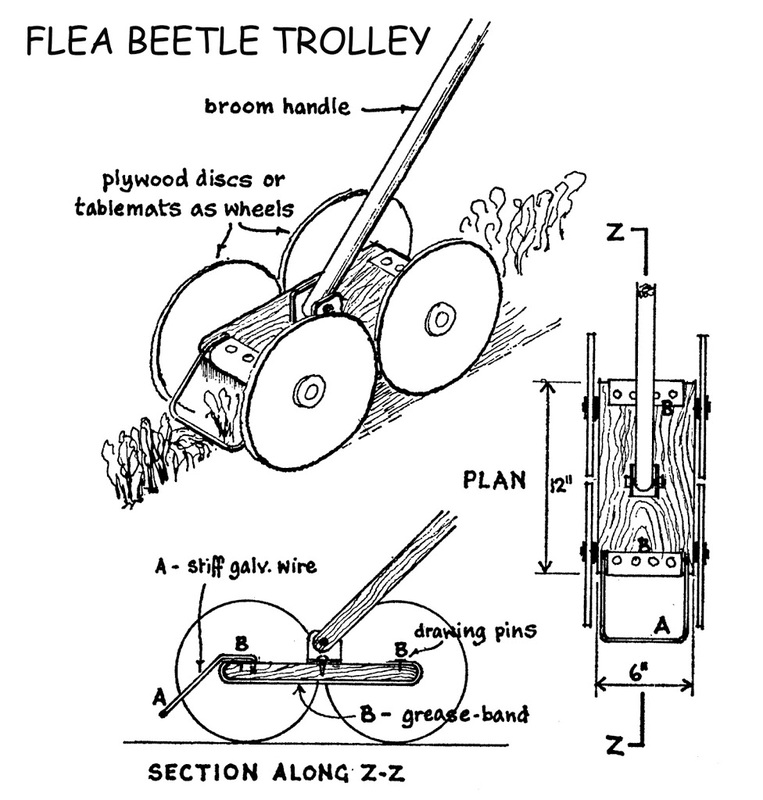 Flea beetles hop away when disturbed and my favorite way to do them in is with the “flea beetle trolley” described on page 144 of Lawrence D. Hill’s Grow Your own Vegetables (Faber and Faber, 1971). Quoting Mr. Hill, “A wire in front disturbs the beetles which jump up and stick to the greaseband [flypaper or paper coated with Tangletrap would also work well]. The large wheels prevent sideways jumping.” The trolley works best on masses of leaves of small plants, such as radishes or arugula, rather than on widely spaced, larger plants with tiers of leaves. Hot pepper may repel flea beetles. Research suggests that commercial “hot pepper wax” reduced flea beetle damage by about a half, so it may be worth a try. I might take the laissez-faire approach to flea beetles as well as Japanese beetles. I’ll keep in mind that established plants tolerate 10 to 30% loss of leaf area without ill effect. Sometimes it pays to look closely at your garden plants; sometimes it doesn’t. My general tack with plant pests starts with offering my plants the best possible growing conditions. This means soil that drains adequately and is enriched with plenty of compost and other organic materials to provide nutrients and a friendly microbial environment. It means providing water, as needed. And it means allowing for adequate plant spacing and light. Still, it’s a wide world of insects, fungi, bacteria, and viruses out there, as well as capricious weather, so there’s no reason to expect perfection from each leaf and fruit. Much damage is nothing more than cosmetic and is tolerated by plants. One nicety of home-grown fruits and vegetables is that there’s no monetary profit needing to be optimized. So some amount of damage is, and also should be, tolerated by us home gardeners. This entry was posted in Uncategorized and tagged flea beetle trolley, flea beetles, grubs, Japanese beetles. Bookmark the permalink. Trackbacks are closed, but you can post a comment. The holes on your eggplants look remarkably similar to the holes on my ground cherries (aka cape gooseberries). I haven’t seen any bugs on them, though I could start looking for flea beetles. It hasn’t worried me so far, since they are still setting fruit. Tolerance of minor pests is a great advantage to being a home gardener! The Japanese beetles haven’t been a huge issue in Madison, WI this year, I’m guessing because of the hot, dry weather. All the lawns are brown (except for a few misguided souls). The few beetles that have emerged are targeting my hollyhocks (passing up roses, apple trees, and cherries!). I squish them as I see them, and go back to watering. You’ve probably got flea beetles. They’re small and they hop away as you get near them. Like you said, though, “tolerance to minor pests….” With good growing conditions, plants often can outgrow flea beetle problems. Great town — Madison. I lived there for 12 years, and studied agriculture there. Do you have any new updates to dealing with Japanese beetles? They are waging war on our garden and I fear they are going to win soon by killing a lot of our plants. We want to remain organic and not spray anything nasty, but we may have to decide soon whether to spray something bad or not have a garden at all! Thanks! ‘Surround’ works. Japanese beetles have turned up on schedule the last three seasons and then, for some reason, left a few days later.